Simple dinner @ One City. This place is basically a place for food. But not those kinda food that you can opt for daily. They have a variety but the selection is too mass and not one of the shops here are a crowd-puller. It's like you'll only come here for food once in awhile or only for certain food cravings. What we needed today was a quick dinner fix for the lazy bums like us that don't mind spending. 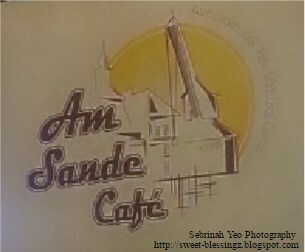 Am Sande Cafe, just a few shoplots away from San Nae Deul at Ground floor in One City. 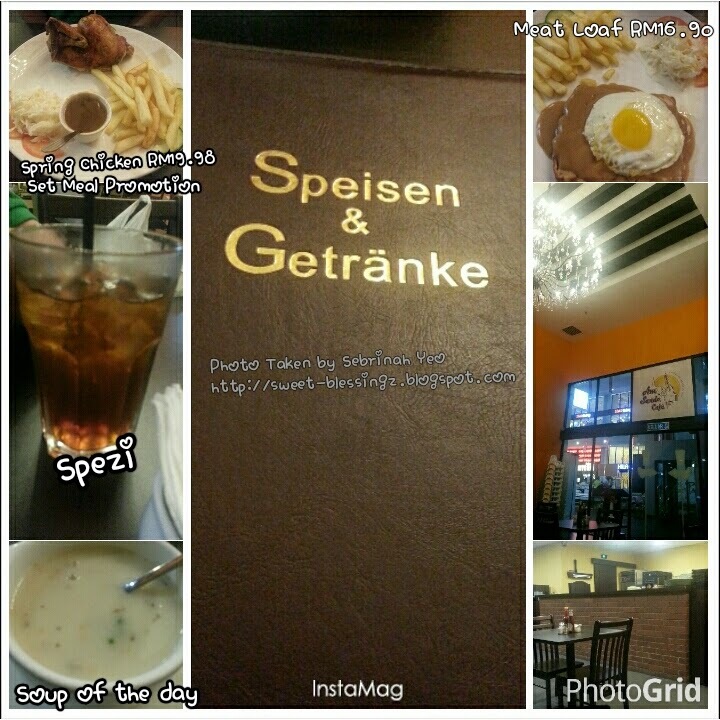 A German western cuisine shop. Their menu is in english btw. We came here for a quick dinner and they had a set meal promotion available. 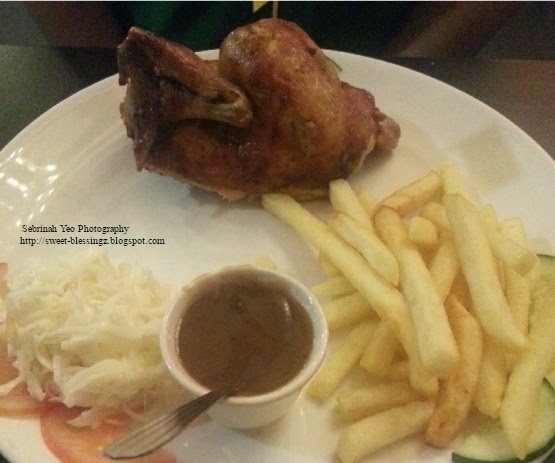 My hubby ordered the Roasted Half Chicken set meal promotion (RM 19.98) comes with a Spezi & Soup of the day. Roasted half chicken looks like spring chicken, kinda small but don't be fooled. The chicken skin was kinda crispy & the meat inside is moist and flavourful. The Spezi is like a mix of Sprite & Pepsi (just guessing). Soup of the day is mushroom soup with mushroom bits, quite tasty. 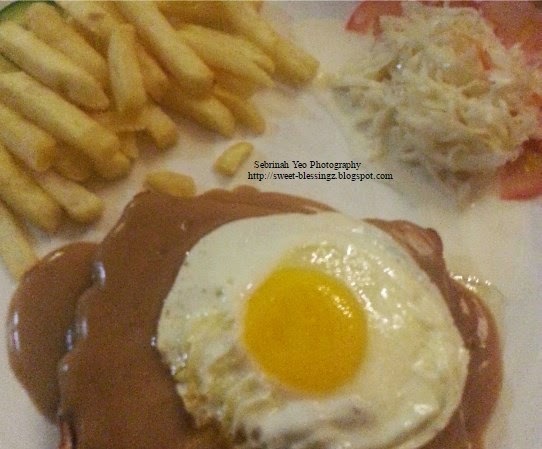 I ordered the Meat Loaf (RM 16.90) ala carte. Don't worry, I did not eat the egg (as said, am in my 3rd trimester). My hubby savoured the egg as usual. The meat loaf was still steamy warm and not served cold, which is good. The meat loaf was thick enough to fill my hunger. It's almost similar to the meat loaf I use to eat at Logenhaus @ Taipan. I won't mind coming back for this dish again. By the way, watch your step when you're in One City, the floorboards are badly damaged, you can see chipped off boards, holes and even bumps! So be careful not to trip while walking. And I'm serious, being pregnant in my 3rd trimester, coming here is like a walking nightmare! The floorboards are just popping out and ready to meet you face down. I've seen lots of kids run, trip and fall face front... Even adults/elderly walk and "almost" trip and fall. Who knows what on earth the Management is planning to do, maybe got problem only fix, no problem no need fix-yet. I hope they do something and quick!